NOTES: The words “one, two, three, four, five,six, seven, all good children go to heaven” originate from an English nursery rhyme. A teenage performer was asked to say these words and repeat them while being recorded in the privacy of his own company. The performer was instructed to speak the words as softly as possible while the microphone levels where as high as possible without causing feedback. The performer was asked to repeat the words as often as possible and in any manner or rhythm that made it possible to do so. After the recording, the performer described a sense of uneasiness and drowsiness that came with the experience. 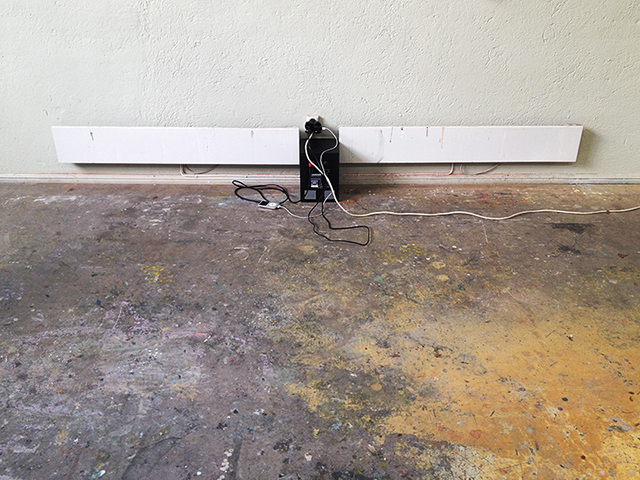 The work was installed in the existing studio situation, between 2 heating elements on a paint covered floor. EXHIBITIONS: Group. Munch Studio, Olso, May 2015. Title: The Human Mountain (Towards The Light). Curator; Tony Christian Norum.